Hayden Hawkey (Parker, Colo.) backboned #11 Providence to a sweep over #8 Northeastern in a home-and-home series, earning his 63rd career win and his 13th career shutout in a Friars uniform in the process. Hawkey is just one shutout and two wins shy of setting new program records for Providence. Maine split a weekend series with #2 Massachusetts, handing the Minutemen just their third loss in Hockey East play this year. 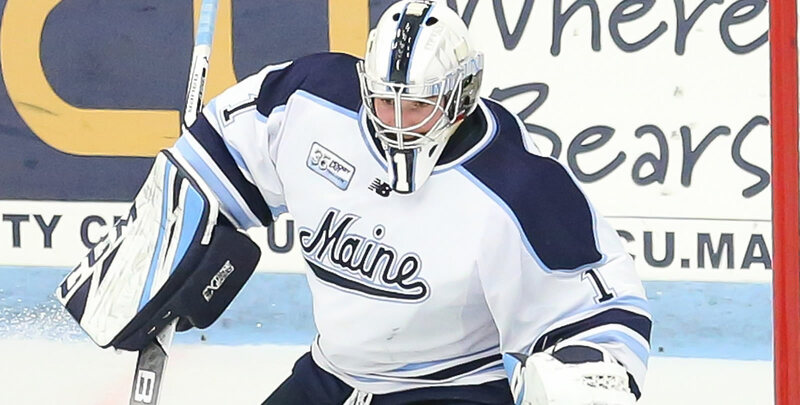 Jeremy Swayman (Anchorage, Alaska) kicked out a total of 113 shots for the Black Bears, anchoring his squad to a 1-1-1 week in league play including Monday's 4-4 draw with New Hampshire. UMass Lowell remains unbeaten in its last seven (6-0-1) after going 1-0-1 in a home-and-home with Boston College. On Friday, Ryan Dmowski (East Lyme, Conn.) posted his team-leading fifth game-winning goal and third straight for the River Hawks, before netting two goals and adding an assist in Saturday's 4-4 draw. He has now scored a goal in five straight games and pushed his point streak to six outings (6g, 2a). New Hampshire earned four points in league play with a 1-0-2 week. The Wildcats are 7-1-3 over the last 11 games played and have outscored the opposition 43-26 in that time frame. Junior forward Liam Blackburn (Prince George, B.C.) posted two goals and three assists for five points last week and is currently riding a 15- game point streak, with nine goals and 12 assists in that span, dating back to Nov. 23. Vermont swept Merrimack in a two-game set. Max Kaufman (Rochester, N.Y.) netted the overtime winner on Saturday to lift the Cats past the Warriors, 4-3. Kaufman set up the Friday game-winner as well. Dallas Comeau (Calgary, Alta.) scored his first career goal and added a helper for his first two collegiate points in Vermont's 5-1 win over Merrimack on Friday. 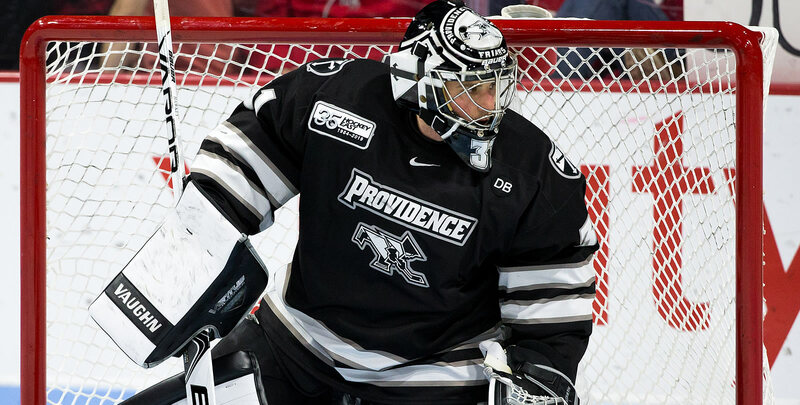 Hayden Hawkey (Parker, Colo.) stopped 53 of 54 shots he faced last weekend, backboning the Friars to a sweep of #8 Northeastern in a home-and-home series. He posted a 0.50 goals against average and .981 save percentage, including a 34-stop shutout at Matthews Arena on Saturday night's road win. It marked a career- high in saves for a shutout in Hawkey's tenure. The senior now has five blank sheets on the year, the second-most nationally of any goaltender, and his 13 career shutouts are tied for the most in Providence program history. Joel Farabee (Cicero, N.Y.) netted two goals, including the game-winning strike, in Boston University's 4-2 win over #15 Arizona State on Friday. The rookie forward also picked up a pair of helpers in Monday's 7-2 triumph against league foe Merrimack. Jeremy Swayman (Anchorage, Alaska) kicked out a total of 113 shots in a 1-1-1 week, including a split with #2 Massachusetts last weekend. He stopped a season-best 53 shots in a 4-3 win on Saturday night over the Minutemen after stopping 38 of 41 in Friday's 4-2 setback. On Saturday, he stopped at least 17 shots in each period, including 19 in the middle frame. Oliver Wahlstrom, BC (Fr., F; Quincy, Mass.) Picked up a goal and an assist in his second career multi-point game on Saturday night, helping the Eagles to a 4-4 tie with #19 UMass Lowell. He finished the weekend series with six shots on net. Patrick Harper, BU (Jr., F; New Canaan, Conn.) Posted a three-point (1g, 2a) on Monday in a 7-2 win over Merrimack before adding an assist in a 4-2 win over #15 Arizona State on Friday. Jake Oettinger, BU (Jr., G; Lakeville, Minn.) Stopped 68 of 72 shots he saw last week in two appearances, helping BU to a pair of victories over Merrimack and #15 Arizona State. Emil Westerlund, Maine (So., F; Linkoping, Sweden) Helped Maine to a 1-1-0 mark with #2 Massachusetts with a three-point weekend (2g, 1a) in Orono. He lit the lamp and added an assist in Saturday's 4-3 victory over the Minutemen and finished a plus-one against UMass. Marc Del Gaizo, UMass (Fr., D; Basking Ridge, N.J.) Posted three points (1g, 2a) in a road split with Maine. He finished with a plus-two rating and four blocked shots. The rookie leads the nation with a plus-21 rating on the year. Ryan Dmowski, UML (Sr., F; East Lyme, Conn.) Racked up four points (3g, 1a) in a 1-0-1 weekend against Boston College. He posted his team-leading fifth game-winning goal, and third straight for the River Hawks, in Friday's 3-1 win at Boston College before netting two goals and adding an assist in Saturday's 4-4 draw. He has now scored a goal in five straight games and pushed his point streak to six outings (6g, 2a). Chase Blackmun, UML (Fr., F; Hudson, Wis.) Totaled three points (1g, 2a) in a 1-0-1 weekend for the River Hawks, which included two points (1g,1a) in the 4-4 tie Saturday and an assist on Friday. Tyler Wall, UML (Jr., G; Leamington, Ont.) Stopped 24 of 25 shots on Friday, picking up a 3-1 win at Boston College. Reid Stefanson, UML (Fr., F; Winnipeg, Man.) Scored two goals in a 3-1 road win at Boston College on Friday. Chase Gresock, MC (Fr., F; Powell, Ohio) Led Merrimack with four points on the week, totaling two goals and two assists in three games. Liam Blackburn, UNH (Jr., F; Prince George, B.C.) Posted two goals and three assists for five points as the Wildcats went 1-0-2 in three outings on the week. He posted three points (1g, 2a) in a 4-4 tie at Maine on Monday. He is currently riding a 15-game point streak, with nine goals and 12 assists in that span, dating back to Nov. 23. Angus Crookshank, UNH (Fr., F: North Vancouver, B.C.) 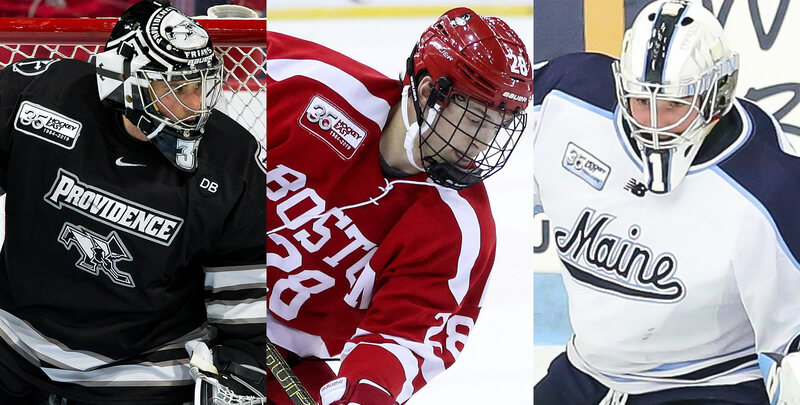 Scored two goals and added two helpers for four points in a 1-0-2 weekend for New Hampshire. The rookie has 19 points over his last 15 games with eight goals and 11 assists in that time frame. Mike Robinson, UNH (So., G; Bedford, N.H.) Posted a 1-0-2 week with a 1.90 goals against average and .937 save percentage. He stopped a total of 89 shots, including a career-best 36 in a 6-0 win against UConn to record his third shutout of the season. Max Kaufman, UVM (So., F; Rochester, N.Y.) Netted the overtime winner on Saturday to lift Vermont past Merrimack, 4-3, and help the Catamounts earn the weekend sweep of the Warriors. Kaufman set up the Friday game-winner as well, on the power play, and finished the weekend plus-two. Dallas Comeau, UVM (Fr., F; Calgary, Alta.) Scored his first career goal and added a helper for his first two collegiate points in Vermont's 5-1 win over Merrimack on Friday. Stefanos Lekkas, UVM (Jr., G; Elburn, Ill.) Picked up a 1.94 goals against average and .923 save percentage in a two-game sweep of Merrimack at home. He held the Warriors to just one goal on 21 shots on Friday before kicking out 28 in a 4-3 overtime victory on Saturday.